The Guitar Wiring Blog - diagrams and tips: How to Make a Small On-Board Buffer? How to Make a Small On-Board Buffer? Today, I would like to show you how to make a really small on-board guitar buffer. It's based on the TL071 op-amp, which is very good for that purposes. It will allow you to make an active buffer with high impedance on the input (1M), and low impedance on the output (it's very important for buffers). The TL071 will not eat your power source too quick - will work hundreds of hours on one, typical 9V battery. It is a very popular construction in guitar electronics. Nothing original, but will work fine for the most of our purposes. 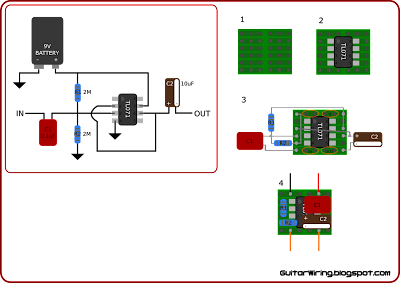 You need only six parts to make it: the op-amp, two resistors, two capacitors (one film, one electrolytic) and some small multipurpose PCB. On the drawing above, in the up-left corner, you can see the circuit of the buffer. The drawing no. 1 shows how your PCB should look like. Most of multipurpose printed circuit boards are bigger than you need for this construction, so you can cut it to reach this shape. The drawing no. 2 shows the TL071 operational amplifier placement on the board. On the drawing no. 3 you can see how to solder other parts to the PCB. 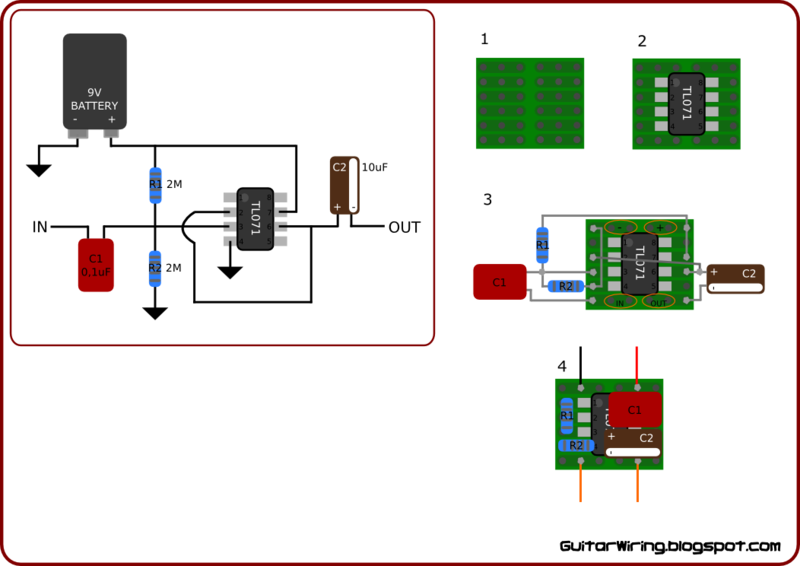 It also shows where is the buffer input, output and power supply connections. The drawing no. 4 shows that this construction can be rally small, if you put everything well and tightly. In reality, it can have ca 16x16x10mm (0,63x0,63x0,4”). It should fit to most of guitars. Don't use high voltage capacitors if you want to heave this tiny size - 16-18V will be OK. I also recommend to use capacitors made for audio purposes (not those very expensive - some Wima, Vishay, Elna, Sanyo, Phillips will be fine) and metalized 1% resistors.